Do you have a rising ninth grader this year? Do you know that THIS SUMMER is one of the most critical transitions in a young person’s academic career, according to the National Summer Learning Association? If you’ve read the first two posts in this series about summer learning loss — i.e., what your student forgets from the time the school year ends until s/he starts school again at the end of the summer – you’ve learned that 1-2 months of math and some measurable degree of reading and language arts learning just…vaporizes… during the summer. Unless you have some kind of program in place to keep that from happening. What’s even more amazing is research shows that often this learning loss is cumulative. Yikes! Not that you should be fearful and throw your kids into public high school! You just need to evaluate activities this summer and if your students aren’t doing anything academic, it’s not too late to add it in. This isn’t rocket science, but it definitely takes determination to put a system in place that keeps your highschooler working on math, reading and writing on a daily or almost daily basis during most of the summer. Schoolish things are the last things on teens’ summer list of to-dos, I know! Because high school work should be more challenging and time consuming than previous work, and it’s much harder to get everything done during this important four years, consider getting a head start on next year’s work during the summer. I know YOU need a break, so try and choose things that your student can do by himself, with your husband if he’s amenable, or even an online class where someone else does the teaching. With those ideas in mind, let’s get specific. Just like in the younger years, the easiest thing to do is just to keep doing math during the summer. Either finish last year’s math text and/or begin next year’s. Again, if someone other than you can work with your student, all the better. If you don’t want to supervise, perhaps a neighborhood college student would be happy to do so for a small fee. Because it is the summer, you certainly could choose to go at a slower pace than you usually do. Maybe do two or three lessons a week instead of five, for example. Another benefit of working on math during high school summers is that your student may be ready sooner to take the S.A.T./A.C.T college readiness exams. This may provide additional time to retake the exam which is helpful to many students. If you have a mathematically gifted student, you might consider sending him or her to a math camp for part of the summer. (I saw that many camps offered financial aid, fortunately.) If you need to plan ahead to do this, consider it for next summer. I recommend all high school students read this book during the summer before ninth grade, or whenever they can fit it in. I’ll tell you upfront – it will not be their favorite book. They don’t even have to read the whole thing to benefit by it. (Have them at least read through most of Part III) The easiest way to accomplish this is to have them read short sections at a time and narrate (tell back) about what they read. The second easiest way is to have them take reading notes. But the best way to make sure they are actually reading and understanding the book is to read it in short sections along with them, then listen to the narration and talk about anything missed. 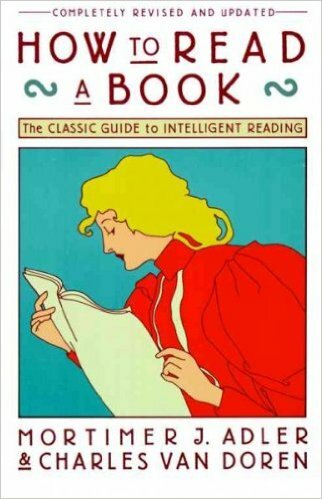 If you look at this book at Amazon.com, you can see by the comments that it is an excellent but rather tedious book to read –but it’s worth it. Why? First of all, you’ll help prepare your high schooler by experiencing that high school work is harder and takes more effort than he may have expended previously. Secondly, part three of this book will teach him how to read fiction, nonfiction, poetry, plays and more. This will help him get the most he can out of his reading — in high school, in college, and beyond. If you read this along with your student, it will help you, too! If your student has already read How to Read a Book, I recommend ordering your high school curriculum early enough to begin the reading earlier. Alternatively, you could have your student combine the reading and writing with the suggestion below under the ‘Writing’ section. Frankly, writing is the area that we’re most likely to skip during the summer. After all, it’s more effort for many students and more effort for us to have to evaluate. But since writing is the foundation for a large part of high school work, I’d make the effort. Here’s some ways to make it happen. Want to get one English elective (½ credit = about 60 hours) out of the way this summer as well as giving your student a firm foundation in writing the five high school essay types? Have him begin or complete our Essay Styles for High School course, written directly to him. Designed as a one semester course written to your student, if your student started it during the summer he could either finish it in the fall or just spend a chunk of time on it and get it out of the way this summer. Have your student keep a journal during the summer and respond to writing prompts. However you set up your summer learning program, know that your highschooler will benefit greatly by you taking the time and effort to make it happen! 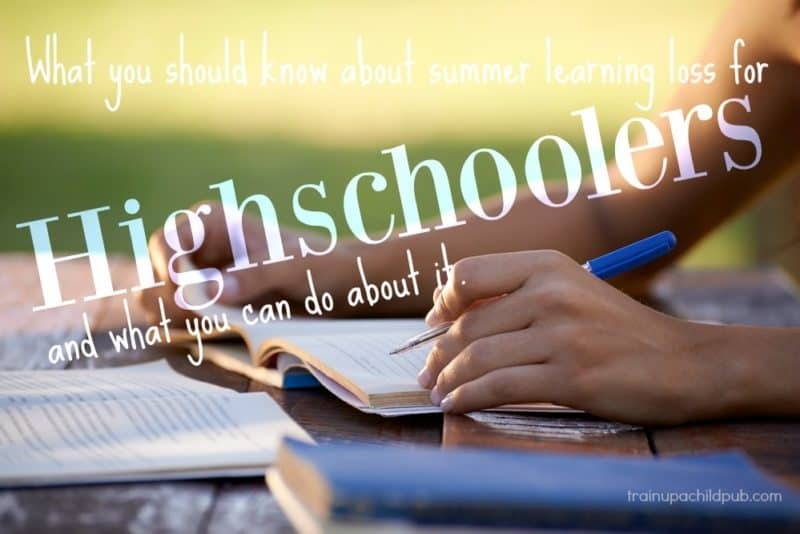 So what are you doing or going to do this summer with your highschooler to help avoid summer learning loss? Have younger kids? Don’t miss the first two parts of this summer learning loss series! Part I, concerning preschool through elementary, and Part II covering what you need to know about summer learning loss for middle schoolers.